Tampa FL Inshore Fishing Charters welcomes you to Tampa Bay, Florida, one of the BEST light tackle inshore fishing around the world. Our Local experts experience gives us the advantage of knowing where and when the fish are biting the whole year. Our expert guides having enough knowledge about the species we target and when and where we have to hit them. What is your fishing dream? Is it to catch a 100 pound Silver King or Tarpon? Or is it to have a Snook blow up on live bait near the mangrove lines? Either maybe stalking redfish in the gin clear grassflats of the gulf or plugging the flats with topwater lures or throwing jigs for large gator trout. Tampa, FL can supply you with the ultimate fishing experience that can't be beat anywhere else. Disocver what there is to explore next time visiting on an early morning or late evening Tampa FL inshore fishing charter. Tampa Inshore Fishing Charters can help you explore the surrounding fishing grounds for Snook, Tarpon, Redfish, Black Drum, Sea Trout, Flounder, Sheepshead, Jack Crevalle, and more while fishing the Flats and Backwaters. So, prepare yourself for the Tampa Inshore Fishing expedition of a lifetime! Using cutting-edge technology, a top-of-the-line fishing boat along with lots of experience and knowledge you’ll get the opportunity to experience fishing adventures and memories lasting a lifetime. 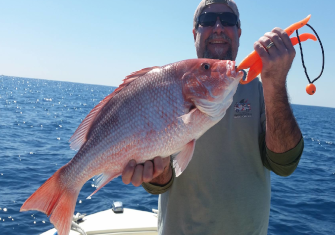 Search iOutdoor, Compare & Book the Best Tampa Inshore Fishing Charters Today. Yes, the fishing charters sell out. We only have certain amount of boats set for each day. The captains do not allow passengers on the boat without advance reservation. Can I pay in cash on the charter? Cash is accepted for the balance, you pay the captain after the trip is over. You must have a reservation in advance with a credit or debit card. Captains do also take credit cards for balance. By booking in advance, you are guaranteed a spot. Is it necessary to print my receipt? No, a printed receipt is not required. The captain will have your name and be expecting you. If you don't see the email confirmation in your Inbox, check your Spam or Junk Mail folder. You should also try performing a search in your email account for the phrase: iOutdoor.com. If you still can't find the email, contact us +1 (888) 412-1117 and we will resend the confirmation. How will I recognize the charter boat? Our charter boats are labeled with iOutdoor logos, you will also have the captain's cell phone on your itinerary if you can't find the boat. You will always generally want to meet down by the boat ramps unless otherwise told by captain. How long does it take before we start fishing? The drive takes different times for different locations and styles of charters. 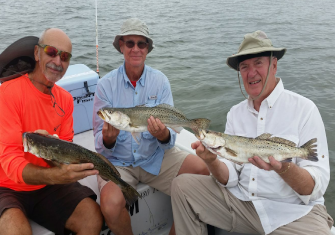 Most inshore and freshwater charters take a 5 to 15 minute boat ride before starting to fish. The offshore charters are ones that can vary based on weather and species of fish the captain is fishing for. It could be 15 minutes, but up to 45 minutes. Again refer to your captain on his call with you and he can provide a detailed plan. Do we stop while we are out on the water? It depends on the customer and type of charter. If passengers wish to take a break, we can stop at scenic areas to stop take pictures, use restrooms or get a bite to eat when available. The charter time is yours, you book for 6 hours and want to fish for three hours and sightsee for 3 hours, that's okay with us. We do ask that you communicate that with the captain, they are fishing captains and focused on catching you fish, so that's what they do unless you advise otherwise. Do you offer Wi-Fi on the fishing charters? Many of the boats have hotspots onboard for FREE Wi-Fi. Due to the nature of the technology and locations that the boats travel there are many locations that may have no service during your charter. Please ask your captain about service quality prior to going, we are not responsible for interruptions of service that are beyond our control..
What are some good items to bring on the charter? Sunglasses, Hat, Jacket, Wear layers, there's plenty of storage. Cell phone or camera, on trips that permit harvest a cooler to take your catch home is important. Will you take us back to our hotel after the charter? No we do not offer this, we can help you contact a car service on the way in so that you are able to get back to your hotel. Can I eat on the boat? Yes, you may bring food and beverages with you. But do not throw trash in the water, it is against the law and you may get fined. Deposit trash in the wastebasket on the boat, the captain will assist you with this. Of course! Photography is encouraged. Our boats have large panoramic windows that are perfect for capturing your catch and sightseeing. We know your vacation photos are important to you because of the way you share them on your favorite platform, when doing so please include @ioutdoor or #ioutdoor and we will be sure to share your pictures with all of our guests as well. Should I bring an umbrella, what about rain? In Florida it is not uncommon for it to rain on one side of the street and not the other...really. Also can down poor and 10 minutes later be beautiful outside. When it comes to weather reports, no one is more predictable than your captain. He has radar and every weather app made as they deal with this all the time. DON'T follow the local weather as the true forecast. Your captain will make the call with your safety in mind, remember if the charter is cancelled due to whether there is no charge. What time do we return from the fishing charter? The boat returns to dock at approximately what length time you booked. Departing 4 hour trips at 7AM return approximately 11:00am, departing 6 hour trips at 7AM return approximately 1:00pm, departing 8 hour trips at 7AM return approximately 3:00pm. Please allow extra time if taking fish, as it takes up to 30 to 45 minutes for captain to clean and package your catch. If you are on a tight schedule be sure to inform the Captain and he will work with you to accommodate your schedule. No, we do not offer courtesy pick-up and drop-off service from hotels as we are pulling the boats and most places we can not turn around. It's most convenient to use Uber or Lyft car service. In layers is best, but fishing is casual. A sundress for ladies with bikini underneath is not uncommon. Khaki shorts for guys is as dressed up as anyone ever gets, long pants work if you're not use to the sun. In the same vein, there are no “styles.” Get comfortable with whatever dress code is norm. But always try to wear light colors as they are cooler. Where can I park my car at the meeting Location? There is parking at most all locations, most are free other places it may be a few dollars, many places are city meter parking. Your captain can tell you the complete cost, if any. How do I buy fishing charter? Book online at iOutdoor.com, or call us at +1 (888) 321-0202. After booking, you will immediately receive an email confirmation containing your receipt for your deposit. It will be followed up with another email with detailed itinerary from office with Captains contact and meeting location. Captain will make contact generally 12 hours prior to your scheduled date. Does the boat have air conditioning? Some do, all the inshore and freshwater charters DO NOT have air condition. Some of these boats do have T-tops or cover, others have no cover. Many of Offshore sportfishing deepsea charters do have air conditioning, although not all. So it's important to ask prior to your departure. Can I bring luggage on the charter? No, but in almost all cases the captain can help you store the luggage while you are out fishing. Please confirm with captain when you talk, how many you will have. Will you pick us up at the cruise ship port? No, we are unable to pick you up at the port. However, it is easy to take a taxi, uber or Lyft to our location and is generally never more than $10.00. Taxis are always available, but cost more than the share-a-ride companies. If a hurricane or tropical storm threatens to spoil your fishing trip, we promise to secure full refunds for customers with prepaid charters. Yes, for large parties. You can email us at fish@ioutdoor.com with the specifics of your group. If you prefer to speak with us now, call or chat with us (407) 392-4593. No, our office is not open to the public. It is strictly a call center, our aim is to give you the best possible prices so it helps. We don't have an expensive office, so we can pass on these savings to you. However, we are available (7 days a week) from 7:00 AM to 8:00 PM to discuss your fishing charter. To speak with us, call our Reservation department at (954) 771-3682! Or you can complete our email form and one of our representatives will contact you. Can I reserve a charter with my hotel concierge? Most likely, but if they don't have our contact please connect them with us and we will get them involved for your convenience. Space is almost always limited, therefore, we have a limited amount of last minute charters. You can call us from your hotel +1 (954) 771-3682 , but your hotel will need to make a deposit for a reservation for you. The two main languages that are spoken are English and Spanish. But it's not uncommon to use translators which captains have on cell phones! 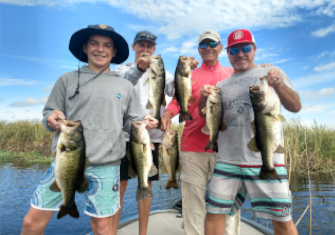 Species:Tampa Inshore Fishing Charters can help you explore the surrounding fishing grounds for Snook, Tarpon, Redfish, Black Drum, Sea Trout, Flounder, Sheepshead, Jack Crevalle, and more while fishing the Flats and Backwaters. iOutdoor fishing calendar has all the information you will need to see what is biting and when! See what type of fish you will be reeling into the boat. Read more.. Call us at +1 (888) 412-1117 and let’s start planning your Tampa Inshore Fishing Charters! For additional Tampa information be sure to go to Visit Tampa.